New Zealand is home to all kinds of weird and wonderful tours – it’s what the country specialises in, and what makes it so special to visit! There are so many unique excursions from top to bottom of the country that it becomes difficult to choose. If you have a strict tip length and budget to stick to, this means working out what the best value options are. If you have never been to New Zealand and have little time to do research, this is a little tricky. But that’s where we come in! Our itineraries come from long experience on the ground in New Zealand, and a lot of time spent putting together great offerings for travellers to this amazing country. 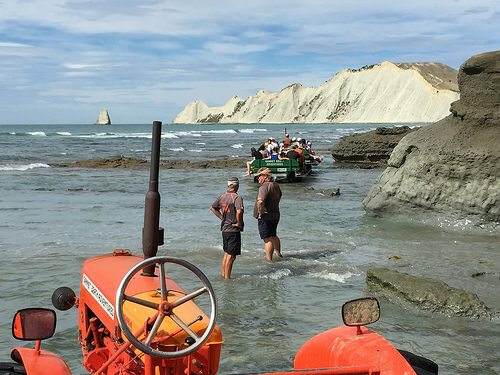 In this post, we are talking about one such offering in Hawkes Bay – the Cape Kidnappers gannet colony tractor tour! Hawkes Bay sits on the east coast of the North Island, curving around the 100km-long bay which it takes its name from. It might not be as famous in tourism circles as other spots in the North Island such as Rotorua or the far North, but it’s well worth a visit. Visiting the Hawkes Bay Region will give you a lot of bang for your buck. The beaches are vast and beautiful. If you’re into cycling or walking, there are some beautiful trails here. It also has some amazing urban offerings; its main town of Napier is world-famous for its Art Deco architecture and accompanying annual festival. Of course, most people already know about the stunning vineyards and food culture that Hawkes Bay is so famous for! The region as a whole has a temperate and mostly dry climate, and so it’s well-suited for visits year-round. Hawkes Bay is a very accessible part of New Zealand, with direct flights into Napier from all over the country. It’s very easy to make this a part of your travels, and you won’t regret it! 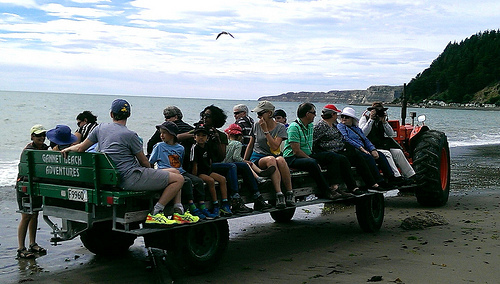 Families should definitely include the Cape Kidnappers Gannet colony tractor tour in their bucket list. The Gannet Beach Adventures company have been doing tours since 1952, and use a very unique way of getting around – bright red tractors! 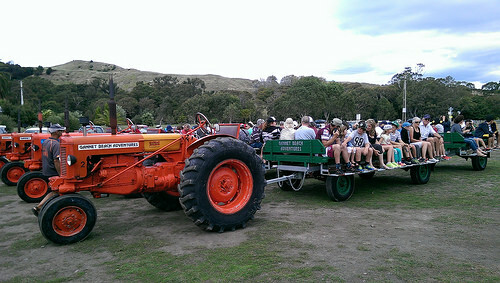 The tractors are able to tow a number of open trailers full of excited travellers. Its uniqueness has helped it to become an iconic ‘Kiwi’ experience for a lot of international visitors. 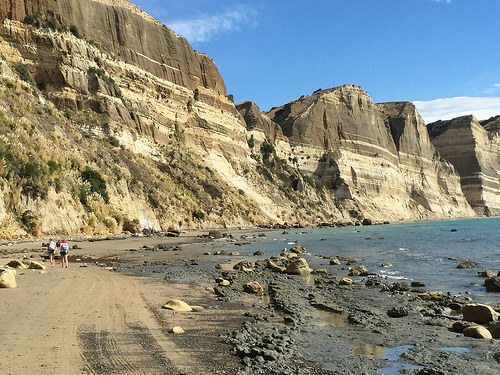 Cape Kidnappers is a truly beautiful spot in the region; the headland is located at the southeastern end of Hawkes Bay, 20km from the town of Napier. It gets its rather dubious name from Captain Cook’s visit to the region in 1769. Whilst surveying the bay, local Maori attempted to kidnap a member of Cook’s crew from the HMS Endeavour. It’s retained the name ever since, though it’s now also officially known by its Maori name, Te Kauwae-a-Māui. The headland is famous for its spectacular coastal walks, but also for being a breeding colony for Australasian gannets! 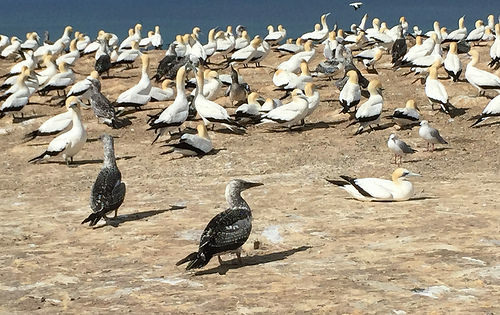 At the peak of the breeding season, there can be as many as 20,000 gannets across the Cape. They are very attractive birds which dive into the water to catch fish, sometimes as fast as 100km/hr! This is a truly spectacular sight that you don’t want to miss. A tractor ride on the beach! The tour starts at the end of the road at Clifton Bay Point. As with many of New Zealand’s coastal tours, you are dependent upon the schedule of the tides. The tour begins at 11 am at low ride, and goes for 4 hours. There is a quick briefing by the tour leader before the tractors head off towards Cape Kidnappers. Now the fun begins! On the particular day that we did this tour, the local beaches had been through a pretty stormy period. The tractors had to negotiate their way through some stony ground and avoid deep holes. There were a few exaggerated shrieks from passengers, but it was great entertainment! 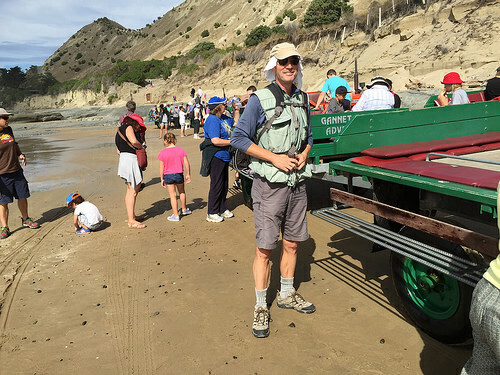 The Gannet tractor tour is a great opportunity to see Mother nature’s handiwork. Over millions of years, these stunning limestone cliff faces have developed all the way down the coastline. A few big earthquakes over the years played a big role in lifting these cliffs out of the ocean. There are some great photographic opportunities here! It takes about 90 minutes to reach the “tractor parking” area near the Cape. At this spot, there is a DoC (Department of Conversation) shelter and fresh water facilities. Do remember to bring your own food for a picnic lunch! The whole area has some fantastic views across the bay. You’ll spend about 90 minutes exploring this area. You can rest and relax, go for a stroll, even swim if you want to! The next part of the tour involves a 30 minute one-way walk to the Cape Kidnappers Gannet colony. These lovely birds are incredibly photogenic, and birdlife photographers love them. I can tell you that on this sunny April day, cameras were at the ready! What makes Gannets so special is that they are totally unfazed by the presence of humans. It’s a heartwarming experience to just quietly sit and watch these lovely creatures. 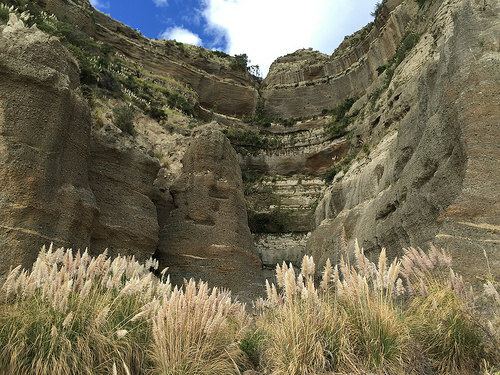 It also gives you time to look around at the environment – at the magnificence of the limestone cliffs, and how they contrast with the soft green of the paddocks below. The tour usually returns on the same route, but you have the option to walk back to Clifton Bay. If you decide to walk back, be prepared for a 10km trek. We actually saw a number of walkers choose this option, and it was a lovely, easy walk along the cliffs. We highly recommend this if it’s a good weather day. At some points, you will need to remove your shoes to cross a few shallow streams. After many years of wanting to do the Cape Kidnappers Gannet colony tour, and we were certainly not disappointed! It’s refreshing to be so close to nature, and an enriching experience for anyone visiting New Zealand. On a warm day, this tour is an ideal way to explore this beautiful part of the Hawkes Bay region! 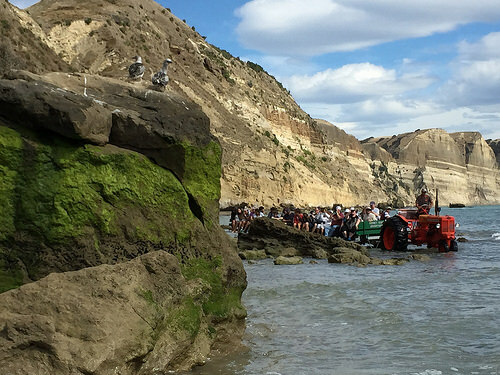 If you want to do the Cape Kidnappers Gannet colony tractor tour, you might want to stay at Te Awanga near Havelock North. The Te Awanga Cottages are an ideal choice for couples – and they’re close to where the Cape Kidnappers Gannet colony tractor tour begins. In fact, if you stay here you can choose to walk down to the start point of the tour. Another advantage is that you’re a mere 20mins drive from Havelock North, which is home to a vibrant food scene. For more inspiring nature tours check out our nature and lifestyle itineraries. It was seeing parents out with their children exposing them to the wild, beautiful and wonderful part of our world. Hey Jan, thanks for picking up on the ‘nitty gritty’. Yes I admit I opted out of walking back. Let me think about it before I come up with a half decent excuse. That’s a striking part of NZ and no mistake – I’ve never seen it before. Thank you for sharing as they say in social media circles. I bet it’s thunderous experience on a stormy day – very invigorating. I didn’t realise gannets were quite such large birds either. Travel well you two. Hi Michael, although it has been 3 years since our wonderful visit you planned for us in New Zealand and Australia, Tom and I talk often about going back to the North Island and to Rotorua for a another chance to trout fish and Hawkes Bay to spend more time. 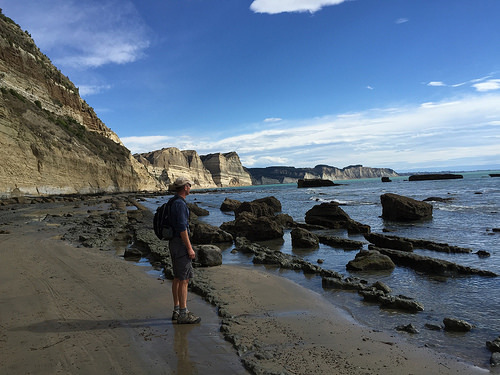 We loved the diversity of the North Island and would love to visit these places too! Hi Rosalie,good to hear from you. 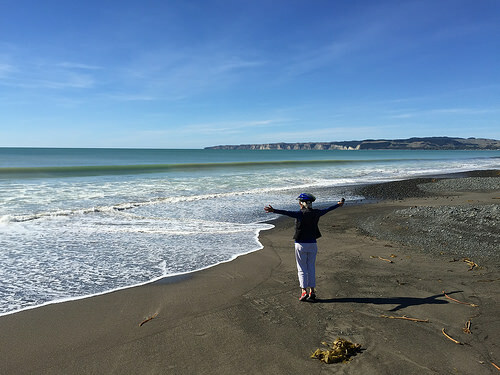 I’m sure you’d love the Hawkes Bay Region of the North Island, as we did. Cape Kidnappers and the surrounding area was a definite highlight. Many beautiful bike trails here as well. 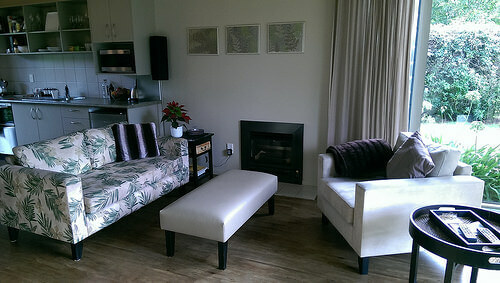 Hope you can discover North Island highlights soon.